Square One Publishers, 9780757003738, 224pp. In the United States alone, 26 million adults have chronic kidney disease (CKD), and experts project that over half the country may develop CKD due to rising rates of disorders such as diabetes. While nephrologists can monitor kidney function and treat patients with medications, they can't always offer the nutritional guidance that every kidney patient requires. 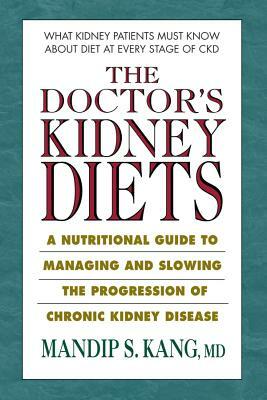 To fill this information gap, Dr. Mandip Kang has written The Doctor's Kidney Diets, a comprehensive guide to managing, slowing down, and even stopping the progression of CKD through diet. The book is divided into two parts. Part One provides a clear overview of kidney function, kidney disease, and the role that nutrition plays in the treatment of kidney problems. The doctor then reviews the special dietary considerations of individuals with CKD, including the need to limit certain nutrients, fluids, and other dietary components. Because different patients have different nutritional requirements, the doctor discusses the most commonly prescribed CKD diets--the DASH diet, heart disease and diabetes diets, diets for dialysis, and more--and concludes with important tips for enhancing overall health and maximizing treatment success. Then Part Two offers a wide variety of recipes for dishes that follow the dietary guidelines highlighted in Part One. Smart nutrition is essential to the treatment of kidney disease. With The Doctor's Kidney Diets, you can become an active, effective participant in your own treatment plan.